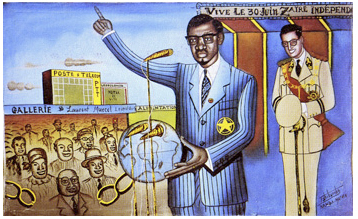 "TKM Lumumba Indépendance " Peinture de Tshibumba. Ca 1972. My father and I have patched things up. He allowed me to accompany him to Leopoldville, where we got to see history in the making. We watched the Independence ceremonies from a giant rusty barge tied to the bank of the Congo River that was loaded with so many pushing, squirming people Mrs Underdown said we'd probably all go down like the Titanic. It was such an important event King Baudouin of Belgium, himself, was going to be there. It was childish, I know, but I got very excited when she told me that. I suppose I was picturing someone in a crown and an ermine-trimmed scarlet robe, like Old King Cole. But the white men sitting up on the stage were all dressed alike, in white uniforms with belts, swords, shoulder fringe, and white flat-topped military hats. Not a single crown to be seen. As they waited their turn to speak, dark sweat stains blossomed under the arms of their uniforms. And when it was all over I couldn't even tell you which one had been the King. […] After the King and the other white men spoke, they inaugurated Patrice Lumumba as the new Prime Minister, I could tell exactly which one he was. He was a thin, distinguished man who wore real eyeglasses and a small, pointed beard. When he stood up to speak, everyone's mouth shut. In the sudden quiet we could hear the great Congo River lapping up its banks. Even the birds seemed taken aback. Patrice Lumumba raised his left hand up and seemed to grow ten feet tall, right there and then. His eyes shone bright white with dark centers. His smile was a triangle, upcurved on the sides and reaching a point below, like his beard. I could see his face very clearly, even though we were far away. Patrice Lumumba asked us to keep this day, June 30, 1960, in our hearts forever and tell our children of its meaning. Everyone on the raft and the crowded banks would do what he said, I knew. Even me, if I ever get to have any children. Aos leitores interessados recomendo vivamente este romance sobre a independência do Congo Belga e as três décadas que se lhe seguiram. A história é narrada a várias vozes, as da mulher e das filhas de Nathan Price, um baptista evangélico que leva a família para o interior do Congo Belga em 1959. A acção estende-se até à Angola dos anos 80. Um livro fascinante, que inclui extensa bibliografia sobre o tema. Em português: A Bíblia Envenenada, aqui.